Constantine's new capital, built on the remains of the ancient Greek city-state called Byzantium, is important to understanding Byzantine architecture. In 323, the emperor of the West ruled over both the Eastern and Western empires. Only a few years later did Constantine transfer the imperial capital from Rome to the new city of Constantinople, which became the center of Byzantine art and culture. To preserve unity in the Empire, churches that were commissioned during Constantine's reign reflected the plans of the Roman basilica used in the Western churches. Following the political schism of the Roman Empire in about 395, an ever-widening breach between the cultures of the East and West produced a distinctively Byzantine art and architecture. This is readily verified by the church architecture of the fifth and sixth centuries. During the reign of Emperor Justinian the Great (527-65), Byzantine churches broke away from using the Roman basilica style in favor of a hybrid between the centralized domed plans of the martyrium (a shrine for a martyr) and the longitudinal plan of the basilica. 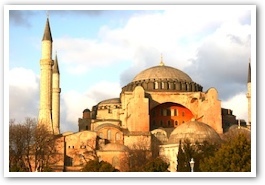 The architecture of Hagia Sophia (the Church of Divine Wisdom), completed by Justinian in 537, set the precedent for the Byzantine "domed basilica," while the Church of the Holy Apostles, also in Constantinople, set the precedent for the "domed church." These two models became the subject of many variations based on the Greek cruciform plan. Until the Eastern Empire fell into the hands of the Turks in 1453, Byzantine architects generally designed centrally planned domed churches, with entrance and apse facing one another on the horizontal axis. It is important to note, however, that the altar of the Byzantine church was always placed at the east end of the church in the apse, never at the center of the church beneath the dome. The dome was considered an essential part of the Byzantine church, and regarded as symbolic of heaven and as an actual part of the New Jerusalem - distant and untouchable yet visible and inspiring. Oftentimes a mosaic image of Christ, the natural focus of the Byzantine world of sacred images, would decorate the central dome as well as the apse of the sanctuary, the two most prominent positions in the church. Noteworthy, too, is that Christ was not usually depicted by the Byzantines as the Son of God or the Good Shepherd as he was in the West, but rather as Pantocrator - meaning Ruler of all Creation or Judge of the Apocalypse. After the Great Schism of 1054, which severed the Eastern Church from Rome, Byzantine church architecture came to be universally identified with the Orthodox Church, while in the West the churches of the Latin rite typically maintained variations of the cruciform basilica plan. The Byzantine style eventually extended throughout the Orthodox world, taking on its own specific "look," especially in Greece, Armenia, Georgia, Russia, (1) and the north Balkans. The architecture of Byzantium also highly influenced some notable churches of the West. The Cathedral of San Marco in Venice (1063-94), considered by many art historians to be the most beautiful of all churches of the Byzantine style, provides a prime example. Venice had close trading ties with the East, (2) and Venetian architecture at the beginning of the second millennium reflected this close association. Because San Marco is an edifice built on such a monumental scale, the architects didn't adopt the simple domed cruciform plan, but used a variation. Designed with a central dome over a Greek-cross floor plan with four smaller domes constructed over each arm of the cross, it reflected the look of Constantinople's Church of the Holy Apostles, yet on a grander scale. San Marco's famous gold mosaics are perhaps more revealing of the Byzantine influence than even the form or arrangement of the building. Most of the mosaicists who worked at the Venetian cathedral originally came from Byzantium. They were masters of their craft who had emigrated to Italy to find work after Iconoclasm had destroyed their livelihood in the East. The heresy of Iconoclasm caused the destruction of images used for religious purposes. Beginning in the eighth century, many of the Eastern clergy (who considered themselves "enlightened" in the Gnostic sense) were opposed to the use of images, not only because they associated imagery with the pagan cults of antiquity, but also because they misinterpreted St. John when he taught that God should be worshipped "in spirit and truth" (Jn. 4:23). The common lay people, however, supported the use of imagery in their churches, as they felt a need to be guided and inspired in their worship by pictorial art. Nevertheless, Emperor Leo III (680-741) prohibited religious images in all churches of the Eastern Empire, which ended in his excommunication by Pope St. Gregory II in 731. Despite the pope's intervention, the iconoclastic doctrine was rigorously enforced. Iconophiles were brutally persecuted. Monks who favored the use of icons were sometimes blinded or exiled. The following century saw the destruction of nearly all-existing religious images throughout Byzantium, and new mosaics were not commissioned. In 787, the Church formally condemned Iconoclasm at the Second Council of Nicea, decreeing that painting and mosaic images representing the divine were permissible and worthy of veneration. Even so, a second wave of Iconoclasm took hold during the ninth century and religious images portrayed in Byzantine art were either forbidden or frowned upon for several centuries thereafter. The use of three-dimensional sculptures depicting Christ and the saints was never accepted in the East. Sculpture remained a forbidden art and has never been incorporated into Byzantine church architecture. But even with those imposed limits on Byzantine art, the contributions of Byzantium were unique and important to the development of church architectures for many centuries to come. The church architecture of Old Russia is best exemplified by Moscow's St. Basil. Built 100 years after the fall of Constantinople, the church was commissioned by Ivan the Terrible as an act of thanksgiving for the conquest of Kazan. The use of "cheerful decoration" and the nine bulb-like domes that cap the church reveals the Oriental influence. Each dome is conspicuously decorated, whether scalloped, twisted, fluted, or reticulated, and each is colored uniquely. The style is immediately recognizable as "Russian Byzantine." The original Church of San Marco was destroyed by a fire in 976. After the fire, Venetians searched the rubble for the remains of St. Mark's body, which were brought to the church from Alexandria in 828. The remains could be found nowhere. When construction of the present basilica was starting, a solemn fast was called and prayers were offered in the hope that the lost relics would be found. On June 25, 1063, as a procession moved through the new basilica, a bright light suddenly shone from a pillar near the altar of St. James. Part of the wall of masonry fell away, and a sweet fragrance filled the church. It was here that the body of St. Mark was rediscovered. It had been bricked into the wall by a careless workman. Michael S. Rose. "Out of the East: The Architecture of Byzantium." Lay Witness (Marh/April 2002).